We decided to build two independent navigation systems. One system will be based around chartplotters from a major marine electronic manufacturer (final selection not made). The second, will be a PC based solution. Obviously, having two systems creates redundancy. However, two systems based on very different platforms will decrease the chances of a single problem taking out both. Our navigation computer is housed in a generic 8U rack cabinet. Below the computer is the Ubiquiti ethernet switch. The Rose Point interface is to the right. We completed the physical set up of PC systems. Snapping components into our generic computer cabinet was quick and easy. Loading Windows 10 created a "missing file" error message which was a PITA. We spent 4-5 hours googling the error message and trying to resolve the problem on board. When we got sick of this, we pulled it out and took it to a local computer repair shop. It turned out that the stick provided by Microsoft was bad so we were never going to solve the problem on board. This twist of fate turned out to be a benefit when the computer shop quickly loaded all our software which would have taken days on board through our cellular connection. The homemade computer is lightning fast and the display is gorgeous. We are very happy with our selections so far. In choosing an internet connection, we borrowed heavily from Panbo's recent articles before purchasing a Netgear LB-1120 4G cellular modem ($88), and MIMO antenna ($27). When combined with our Shakespeare cellular amplifier (more to come on this), cellular coverage is excellent. In making our decision, we read the sales materials, studied a number of YouTube videos, and spoke to sales reps at boat shows. But, the most compelling endorsement came from the Adventures of Tanglewood. Coastal Explorer offers excellent planning facilities. One can easily flip between raster and vector charts and charts from different sources. So, we can plan a route using basic vector charts. We can then study the route using raster charts and charts from other sources. The idea is that we will build our routes based on all the available information. This PC based system will interface with our autopilot. 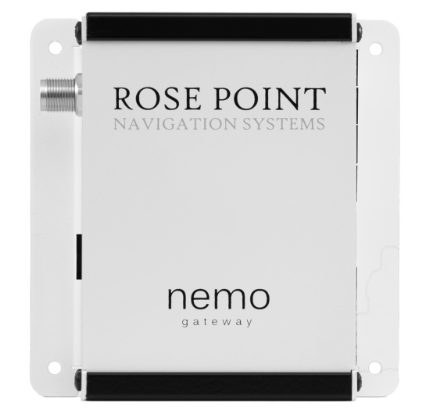 A large part of our decision was driven by Rose Point's Nemo interface ($699). Nemo is a device that enables communication between the NMEA2000 and NMEA0183 marine devices, and a computer. There are a number of ways to accomplish this. Nemo pulls all the information into a single box, and fully complies with NMEA standards making the system more stable than many other interfaces. Nemo will let us select (or ignore) devices connected to the system, which is critical. On the one hand, we want an integrated system and the ability to incorporate new technology. On the other hand, we want to ensure that there is a firewall between our central navigation system and recreational devices. Nemo will prevent other devices from interfering with our navigation system. We can also set priorities. We have multiple GPS sources. Nemo allows us to select the order in which the GPS are used. We will program Nemo to first use our reference quality Lars Thrane GPS system on its NMEA 0183 wiring and then the Furuno LT-1000 if the Lars Thrane fails. The display for our PC based navigation system is flush mounted in the original chart table. This is a touch screen system. We do have a backup keyboard and mouse in the top drawer (visible in the lower left portion of the photograph). Since the screen is flush mounted, we can easily use the table for traditional, paper charts. Note that the glare is a problem with the camera. We also loaded PredictWind onto the navigation computer. PredictWind is a subscription service. There is a free version that shows wind and wave predictions in increments of 50KM. A paid subscription service offers weather models in 1KM increments. This allows us to select between PredictWind's proprietary weather models as well as the most popular publicly available models. The system will download GRIB files (standard weather files)and push them into our chartplotters and navigation computer. PredictWind also offers route planning assistance. We enter the intended route that we developed using Coastal Explorer. PredictWind then calculates the best date and time for our departure. We can also use PredictWind to adjust our route for the most comfortable course considering wave predictions. A sample screen with general wind data. More detailed information is by subscription. Wind and wave data in table form.